I felt like reading some thing different this time around and found this little gem. I think it was good poetry, but at least in my copy the layout was crap and ruined the experience a little bit. 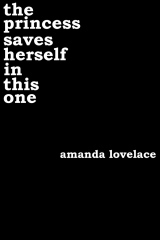 I give The Princess Saves Herself in this One by Amanda Lovelace four out of five hearts because I liked it, but the layout of the text didn’t work for me. I think the story Amanda is trying to tell is great, it’s about being strong, but also about being true to yourself. I enjoyed it very much. But I didn’t like they way the text was structured on the page and it kept me from fully enjoying the poetry the way it was meant. I would advice every woman to read this book and think about what Amanda has written for a while. Because I think Amanda Lovelace has a message here. This entry was posted in Book Review and tagged Amanda Lovelace, Book Review, Nonfiction, Poetry. Bookmark the permalink.